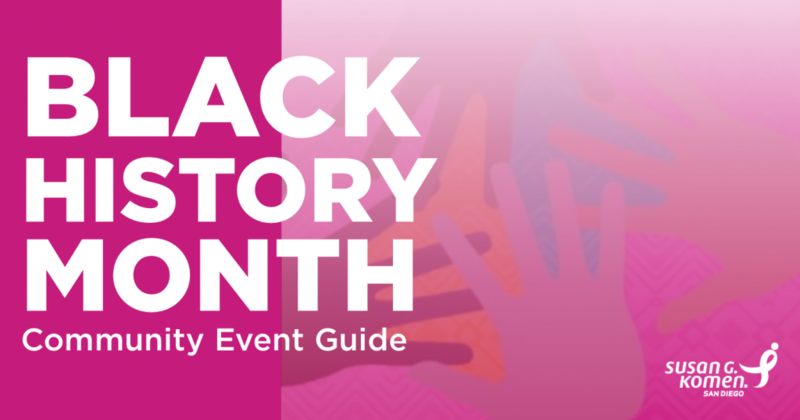 Black History Month is a time to celebrate and honor the African-American and black culture and the extraordinary historical leaders that have led revolutionary movements in our nation. Join the celebration and attend events happening throughout San Diego County. Join us for A Panel Discussion, Women of Color: Running and Winning. A panel of dynamic women leaders will reflect on 2018, a banner year for women of color running for office, share insights from their own campaigns and shed light on the required groundwork for the 2020 election. Get tickets here. This event will provide access to breast health information and free mammogram sign-ups for uninsured or underinsured women and men in San Diego County. Click here for more information. The African-American Advisory Council of San Diego Repertory Theatre presents the 27th Annual Kuumba Fest Gathering: Black 2 Excellence. This experiential three-day, arts empowerment, Afrofuturism focus mixed-media edutainment extravaganza for all of San Diego will be held at the Lyceum Theatre from Friday, February 8th to Sunday, February 10th, 2019. Featuring workshops, dance, film screenings, cultural food competitions, youth programs, African Market Place, and more! Learn more. The second annual Keepers of the Culture comes February 9th of 2019. Please join us in celebrating those who have helped keep black culture alive in San Diego. This year’s honorees include Dajahn Blevins, founder kuumbafest; Makeda “Dread” Cheatom, Founder and Director, The World Beat Center; and San Diego Sculptor, Manuelita Brown. We hope that you’ll join us in honoring those who call attention to the beauty of black heritage in San Diego. Space is limited please reserve your seat today. Jack and Jill Incorporated of San Diego is holding a community forum during Black History month entitled Black Excellence in Public Service: Serving and Protecting our Children. The panel discussion will be moderated by our very own San Diego Chapter President, Pamela Gray Payton and will provide space for a conversation from a diverse panel about the different ways one can serve their community and improve the lives of our children. Times are very different now for this generation of children so join in on the discussion that’s sure to empower us all. Learn more. 1619 NCBW is dedicated to educating and uplifting Black women and girls about their ancestors while encouraging them to walk in their power. The San Diego celebration will begin with a celebratory walk along Harbor Drive and conclude with exciting festivities at Ruocco Park on the Bayfront, including powerful speakers, entertainment, special guests and more! Learn more. Share with us some of your favorite events! If you are in need of breast health assistance, please contact us at (858) 573-2760.